Just how comfortable is your comfort zone? This week we thought we’d give you a little conundrum, as well as a new perspective on your comfort zone. And, why it isn’t quite as comfortable as you thought it was. Confused? We thought you may be (!) but, trust us, it’ll all make sense in a minute. 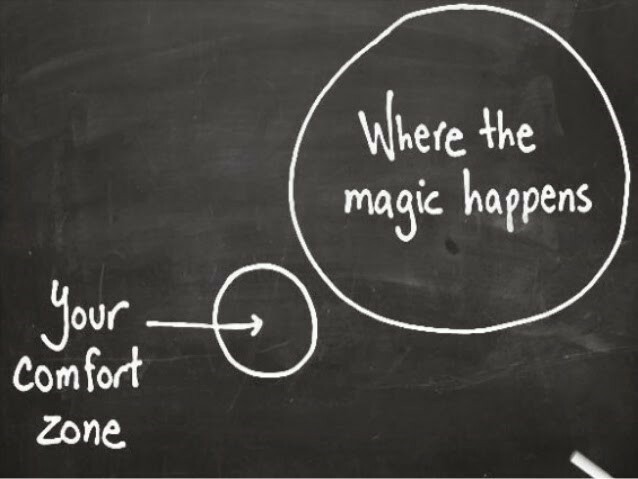 And that perfectly sums up what your comfort zone is all about. Safety, security and certainty. Knowing exactly where you are and what’s going to happen. It’s what keeps people doing the same things over and over again. Or, from another perspective, in a rut. While we’d all agree that a degree of safety and security are a good thing – and part of our most basic survival needs – they can end up stifling us. Taking the joy and spontaneity out of life. Set against this is our desire to have more than we currently have. More things. New experiences. And the like. But here’s the rub, getting these involves doing something new – or different – which takes us outside our comfort zone. And this can lead to some inner tension. It also raises an important question. And one we hinted at with the heading for this post. If your comfort zone was so comfortable then why would you want to go outside it to experience something new or different? While you may not hear many people say it, the fact that you desire anything new – or different – shows that your comfort zone isn’t really as comfortable as you thought. If it was, then you’d be happy with what you already have and wouldn’t want anything else, would you? Really it all boils down to a question of degree. How much do you want whatever it is AND how far are you prepared to go outside your comfort zone to get it? The advice all too often given is to go for things or experiences that are big and scary. In other words well outside your comfort zone. The rationale behind this is that it’ll create passion and excitement, so inspiring you to get them. Sadly, all too often, it has exactly the opposite effect. More like “bunny in the headlights” leading to fear, procrastination and failure. And, continuing on the bunny theme, involving very little carrot and far too much stick to achieve (!). Wouldn’t it be better to start with things or experiences that are only just outside your comfort zone? Ones that give a tingle of excitement – “I haven’t done this before but know that I can” – rather than a fear induced paralysis. Something you get pleasure and satisfaction from achieving, as well as from the process of getting there. In other words from the journey – however short it may be – as well as the end result. And in so doing building your confidence for forays further afield. More carrot than stick. Let’s take a simple example of buying a new car. If you’ve only ever bought older second hand cars then going for a big new shiny top of the range model is going to be well outside your comfort zone. Instantly your focus changes from the excitement of owning a new car to all the reasons you can’t have it. How on earth will I pay for it? Can I get a loan? What about the repayments? And running costs? The list goes on and on. And, bingo, you’re stuck in a state of fearful indecision. Sadly we all know what the end result will be. Giving up on the idea and using this “failure” to beat yourself up when you’re having “one of those” days. So what about if you only stepped a little way out of your comfort zone? Say, you decided to go for an “almost new” ex demonstrator car. It’s a better model than you currently have and only a few months old. In fact it still has that new car smell when you open the door. Not only do you feel excited by the prospect but, most importantly, you can imagine having it. How good it feels to drive. How it only costs a little bit more to insure, service and run than your old car. In fact, it almost feels as though you’ve bought it. Sorting out the practicalities has suddenly become much easier, something you can do without much effort. Before you know it, your new car is parked on your drive. You’ve stepped a little way outside your comfort zone, built your confidence and made your next foray into the unknown much, much easier. So often it seems that we make life much more complicated for ourselves than it need be. And, in the process, set ourselves up for failure and misery. Not to mention a big stick to beat ourselves up with on the days when we’re feeling less good about ourselves. Wouldn’t it be better to start small, stepping only a little way outside your comfort zone? Slowly building up your confidence with one small success after another? After all it doesn’t take many small successes to create a big one; just as any journey begins with one small step.